McLean, Va., March 15, 2016— Corcentric, a provider of cloud-based financial process automation solutions, announced it will host a free webinar, “Top 5 Habits of Highly Successful Accounts Payable Departments” on Wednesday, March 23, 2016, at 2 PM ET, 11 AM PT. Enterprises are turning to business process automation solutions in increasing numbers as they come to realize that automation goes a long way in controlling issues of time, accuracy, and cost. According to an Aberdeen Group research report, companies investing in automation see an 80 percent reduction in invoice processing costs and a 70 percent decrease in invoice processing times. 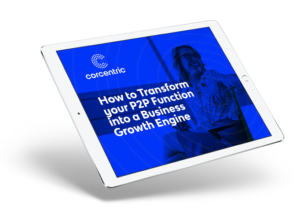 Hosted by AP automation industry expert Rob DeVincent, Vice President of Product Marketing at Corcentric, this latest webinar will help attendees looking to unlock the strategic value of their AP processes by providing clear examples of what drives success. For additional information or to register, please visit https://www.corcentric.com/resources/top5habitsofhighlysuccessfulapdepartments/.